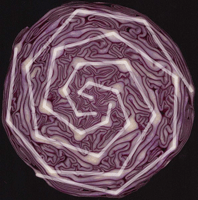 A Cabbage and a Golden Spiral. This is part of our shape hunting series. We’re getting into more depth now. can you see the spiral in the way the leaves form? okay, so does this help to see it? grab a cabbage and check it out, it’s there. 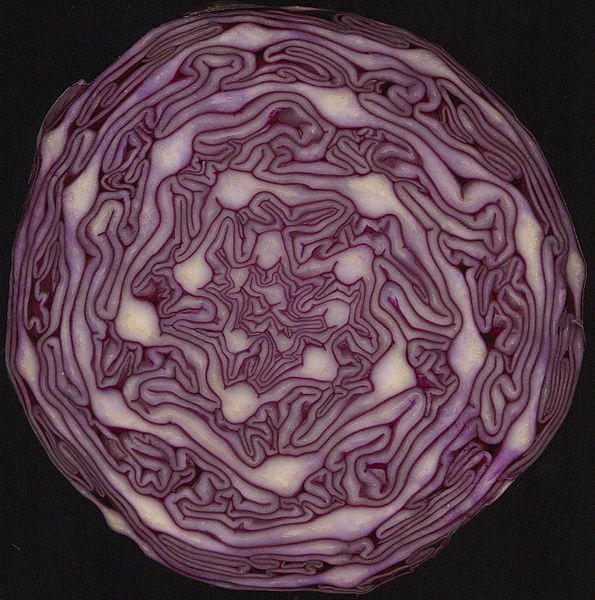 Remember to cut through the belly of the cabbage. 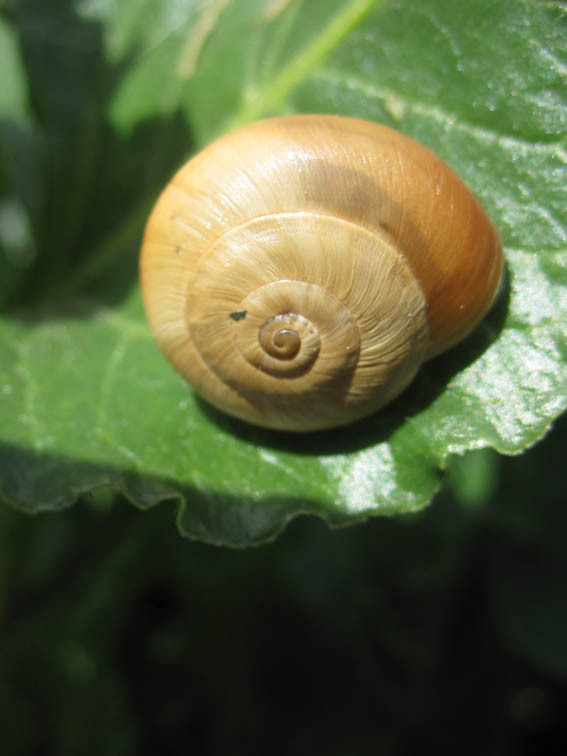 The fibonacci sequence is a series of numbers that underlies plant growth. Leonardo Pisano was known as the greatest mathemetician of the middle ages. Born in Italy about 1175 AD. (not to be confused with Leonardo da Vinci who was born nearby a few hundred years later) Leonardo Pisano introduced the current decimal system of numbering we use today, amongst his other achievements. The fibonacci sequence is a sequence of numbers made by adding the previous two together to get the next number in the sequence. If we use the fibonacci numbers to make a spiral we can see it growing and see how the cabbage got to where it is and how all plant growth relates to it. Mark out the length of the numbers in the sequence on paper. thread the straw in the order of the sequence only string starting with a bead to stop them sliding straight off again. when you have on as many as you have cut, leave a small length of string (for the turns) and then tie off. 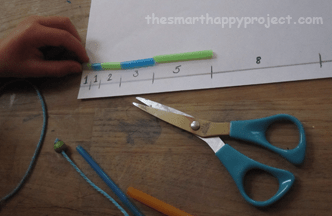 starting with the bead (which acts as zero in the sequence) shape the straws into a spiral without bending the straws, just bend at the breaks in between the straws. We found it helped to fix them to the table with a bit of blue tack as you go. It is a ‘self accumulating’ spiral that grows from within itself and a pure manifestation of Fibonacci numbers in nature. Do you recognize that spiral anywhere else? the shape hunting can carry on now, widen the search from food though. hurricanes in weather systems and star galaxies. That is one luxury that modern technology affords us that wouldn’t have been available to the ancients. This spiral forms the blueprint for many growth patterns, it is around us yet we’ve come to not really see it anymore. Just a note here. This spiral is the golden spiral which is found across all naturals forms. Not to be confused with the archimedian spiral (Archimedes made some interesting discoveries too, but more on him later) an archimedian spiral grows at regular fixed rate. 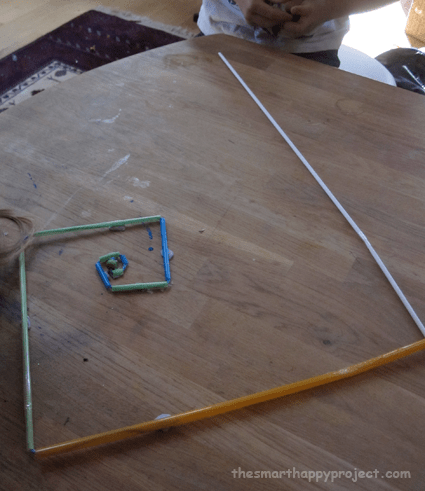 You can make an archimedian spiral by doing the straw exercise again but with regular consecutive numbers 1, 2, 3, 4, 5, 6, 7, etc. see how it turns out. 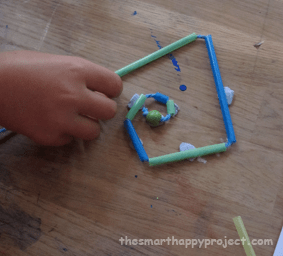 An example of an archimedian spiral is a toilet roll. Ok, back to the golden spiral and fibonacci numbers. 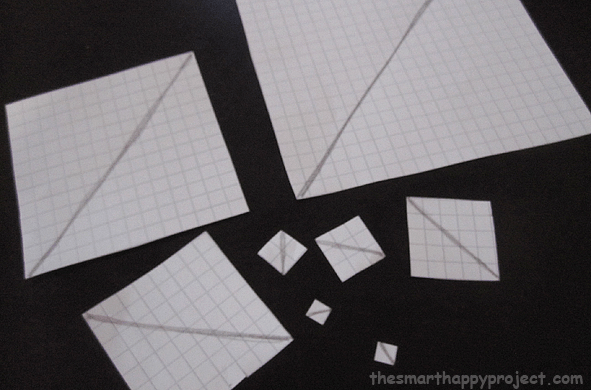 make your own golden spiral with just square paper. now position the squares so that the spiral appears, making sure to have all the edges of the square flat next to each other without gaps. Here’s a puzzle of the golden spiral, if you haven’t made your own. It the same as the squared paper yet I’ve curved the spiral line. Just let your youngster move the squares around, lining them up to get a feel for the growth of the sizes. 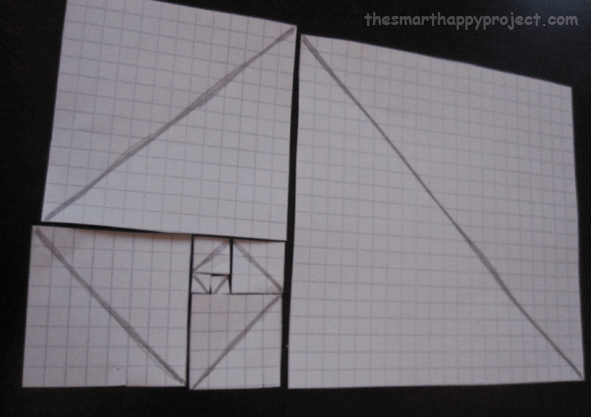 Cut the pieces out and place together to make the golden spiral. This spiral sits inside squares made up from the numbers of the fibonacci sequence, the rectangle that a group of these squares makes is the golden rectangle, we’ll look at this in more detail when we look at shapes in art and architecture. Keep reading! have you signed up for the email updates? Wow! That’s a lot of numbers for a cabbage. If you want to learn more about numbers and fibonacci go to mathisfun. This is a useful website with complex maths explained simply. 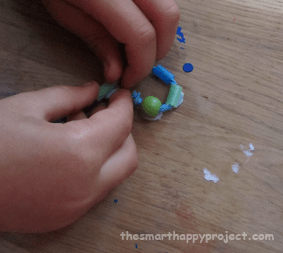 Let me know how you get on, if you have found this post interesting please share it with three friends, to spread the word about the Smart Happy Project. check out the facebook page for more images of spirals.